Welcome to my MVC Java Tutorial. I have been asked for this tutorial many times in the last few weeks. To understand the Model View Controller you just need to know that it separates the Calculations and Data from the interface. The Model is the class that contains the data and the methods needed to use the data. The View is the interface. The Controller coordinates interactions between the Model and View. The video and code below will make it very easy to understand. also waiting for your game development tutorial. yeah off course i will like them. Thanks for the very useful Videos! I have always wonder shouldn’t the model store ALL the data that is going to be displayed in view like first_number and second_number as well? Assume an example where the first_number is the score of a student out of total marks which is the 2nd number. The sample function is going to just calculate the % of the student in the test. Assume the view wants to print the whole report of student later, it could just ask the model for that information? What do you think? Thanks again! Thanks for the very useful Videos! I’ll cover JEE concepts as soon as possible. I go out of my way to avoid having the model do anything but handle data and process data. I try to have the controller handle all communications between the Model and View. This isn’t the only MVC pattern by any means though. Many allow the model and view to interact. If the code is understandable I have no problem with that. Hello! Incredible tutorial, but I have one question, if you can help me. How you work in the controller class if you have a model made by 2 classes for example? Excellent tutorial. I am just started learning about MVC and this is the best job I have seen explaining it. because it seemed odd that I could type a value into the solution field. Love the site. Just found it and I will be spending a lot of time here! I’m from Queretaro Mexico, dude I really love your site, your work is just amazing. I’ve a question, hopefully you can guide me, for example, if I have two or more buttons in my main window and each one has a different action, should I create one inner class in my controller for each different button ? Is that the right way to do it ? Easy does it… Nice tutorial. Awesome tutorial! I’ve been out of the programming realm for a while now, but I want back in, and recently I saw MVC as preferred knowledge for a job opening. Google got me to your tutorial, and I must say I have a great understanding of what’s involved in MVC. Now I just have to reinvent my programming methods, which are pretty rusty and outdated anyway. Thank you 🙂 A major step for a programmer is investing some time into understanding object oriented programming completely. That is probably what you are struggling with? The whole idea behind MVC is to separate the components so that they can be changed without breaking, or even effecting the rest of the system. Just like how we can put new windshield whippers on our car with worrying about the whole car breaking. pleas can send you assignment need to develop by MVC pattern please? 1) So, the whole concept of MVC is to break down the code into seperate programs to make coding more clear, is that true? Meaning, instead of writing 1 program with thousand lines of code, we break down into 3 different programs (1 for model, 1 for view, and for controller). Is that correct? 2) I want to practice using Eclipse and copy your code and play with it. Can you tell me what I need to do? Do I download Eclipse? How do I set it up? What else do I need to download in order to follow your Calculator code? 3) Can you give me another tutorial like this but using SQL database? Like an address book scenario. Can you please explain to me? 1. MVC is used for many reasons. It helps break pieces of your system into real world objects. It also makes it easy for you to change the model and view without breaking your program because the controller handles communications between the two. 2. I cover how to install eclipse for java here. but i have small question. So the Main function can directly access to theView? Isn’t it should be theController that set theView to be visible? Thank you 🙂 Main could access the view, but the controller does all of the work. I don’t want to tightly couple the view and controller by having the view created by the controller. Does that help? This is the simplest, easiest and the clearest example of MVC I’ve ever found. Thanks. Thank you for the nice compliment 🙂 You’re very welcome. I find your tutorial very useful. I have created a view made up of three input components. Two of these provide the filling for sql stored procedures executed by the controller. I have created a model for each of these components. There is only one controller. Is this the best way to do it? What is the best way of identifying which button was clicked, there are three. Would you use the onFormEvent or just use an action event on the buttons involved. How would you update the model and view from a controller that ran a sql stored procedure. Sounds like you set up everything well. For something like that it makes sense to have just one controller. I’d monitor action events like you said to make updates for the view. Great job! I have some questions by the way. 1. If I have difernt views (forms) I need a different controller for each one? 2. How do I stablish communication between different controllers? 3. Do you have a DOA pattern example? Thank you very much for such a great example. 1. You should have 1 controller in most all situations no matter how many views you have. You can have many models and many views however. 3. Sorry I haven’t covered that pattern yet, but I will when I cover JEE topics. Thank you very much for you article! Thank you 🙂 I’m glad you enjoyed it! Thanks for the wonderful tutorial. I have a question: How exactly is this different from MVP, Model- View-Presenter? I thought that in MVC the model updates the view, whereas in MVP the controller liaises between the View and the Model (which is what you’re doing in this tutorial). Hello, You’re very welcome 🙂 I’m glad you enjoyed the video. A very good example , thank U . The MVC pattern shown here demonstrates changing the model data by interacting with the view which is fine, but how would one change the model data by having the two numbers initially stored in a file and then reading those numbers so that the Model and View are updated? Lets say we have defined class that reads the file and stores the two numbers in instance variables of that class. How does that class fit into the MVC pattern? Thank you 🙂 That is why the MVC is so brilliant. If you need to add a feature and the user asks for that feature everything changes accordingly, but they still don’t need to know how the task is performed. 1. The view updates to allow the new feature if it must. 2. The controller catches the request from the view and passes it to the model. 3. The model performs the needed calculations and then sends them to the controller. 4. The controller provides an update to the view. 5. Anything can change and as long as we can agree on a solid way to communicate we don’t lose flexibility. I hope that answered your question. thank you so much in advance!!! Thanks for all these tutorials, they are great. in advance, thanks for your response. You may want to take a look at my Android tutorials because everything is based on MVC. You basically have one controller that handles all communication between the views and the models. If the view needs to change it tells the controller and it serves up a new view. If a new calculation is needed in the model the class is added and the controller just needs a way to communicate with that new class. A very helpful tutorial indeed!!! go ahead!!! Very nice example, just I have a question, how can I do to use some Controllers not only one? I need to create some class that would be working like a “Dispatcher”?? I hope you can answer to me! Thank you 🙂 The idea behind the MVC is to only have one controller. I may not have explained that well in the tutorial. I’ll make a new MVC tutorial to cover the issues that have been brought up. Wow, so clear and easy. Thank you so much, this is good stuff. Thank you 🙂 I’m glad you liked it. Thank you man… 🙂 you explained it well. now its easy for me to manipulate the codes. once again thanks a lot. ideas for it because there are lot of tutorials in YouTube . The Java book that everyone seems to like is the Head First Java Book. I know a lot of people want Java enterprise tutorials and I’ve never made one. I think NetTuts has one you could use as a guide. is it possible to create a social networking website in java? Yes, but it would be very complex from a security perspective. i am actually creating it. so it is OK to do it? I’m sorry, but I don’t know what you are referring to in regards to security? Hi Derek, Sorry that I’m bit off the topic, but do you use any autocomplete plugin for eclipse or just Ctrl+space? Hi, I used to just use Eclipse code completion. Lately i have been using Android Studio and intelliJ. Can anyone help me? I’m new to Java as well as MVC. I made the program work by following the tutorial, but is there any more models for MVC instead of a Calculator model? or does it depend on what we put inside the java to make it look and work like a calculator? 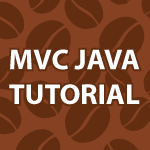 MVC is all about separating the interface (view) from the backend code (model). There are many different types of views and models, but they way they interact is basically the same. The tutorials are nice , the way it is covered. Fantastic explanation of rationale and implementation. Stream of consciousness coding works well. We want more! Thank you 🙂 Yes that is one of the things that I think helps to make my videos original. I’m glad you like that style. Very concise illustrative example, much appreciated. This was very useful in learning about the MVC. Can u please show or point me to a simple java application(code) that is developed according to the MVC which uses a database. Thank you 🙂 Android follows the MVC format. I have a bunch of tutorials on it. This is amazing! I never thought we can MVC in swing! Thank you for this tutorial!! It definitely cleared things up about the basic structure of the MVC model. I do have a question, though: You mentioned in a response to another commenter that a project could have many models and views but should only have one controller. Could you explain or demo how to have this program call and display the solution in a different view when the user clicks ‘Calculate’? I’m trying to understand how the controller gets any other view or model than the ones you passed to it from your main class. You’re very welcome 🙂 You could definitely have multiple MVCs in one project. It is very common though for a controller to implement an ActionListener and contain a List of ActionListeners to maintain multiple models and views for example.